From October 2016 through May 2017, we were privileged to travel to all fourteen MARC communities. 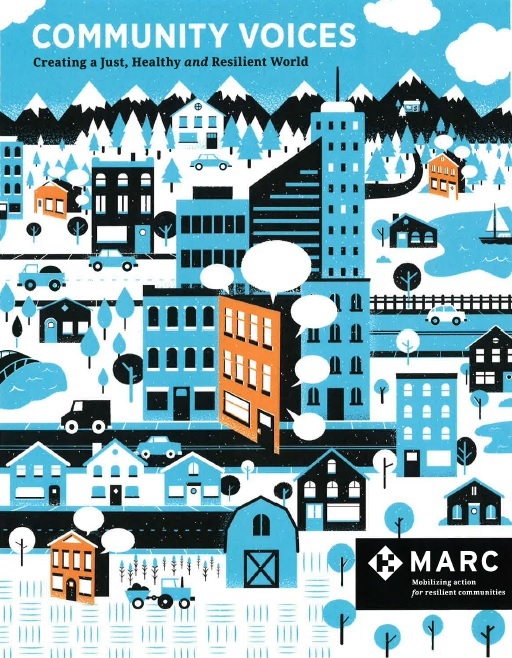 During our whirlwind visits, we asked MARC leaders to show us concrete examples of how their networks were building community resilience—no small feat, given the often-intangible nature of our work. They rose to the occasion. As we journeyed from coast to coast, small town to big city, we were fortunate to meet people from all walks of life – pastors, doctors, teachers, parents, police officers, young adults, artists, community organizers, legislators, business owners and more – who have come together to create the scaffolding that supports their communities in building a culture of health. The people we encountered, the programs and organizations we visited, and the stories we heard inspired the Community Voices collection. These stories, captured so beautifully by Anndee Hochman, represent only a handful of the conversations we had and the places we visited. Together, they reveal the breadth, diversity and creativity present in these communities. We hope that, like us, you will be moved and inspired by them and that you’ll glimpse your own community, neighbors and possibilities in these portraits. We are deeply grateful to the people who shared their stories in Community Voices, as well as the hundreds of others we met along our travels. We would also like to thank the Robert Wood Johnson Foundation and The California Endowment for their generous support of this work, and all the MARC communities for their passionate commitment to making this world a better place.